What kernel version will it be included in? When do you estimate it will reach the core repository? It's not even in the official tree yet. It's only been proposed, though I expect it to be put into either a later 3.11 rc or 3.12. From powertop it seems that while there's a regression on the i915 driver which the recent commit should have fixed, there's another huge power regression which started some time after 3.5.6 and hasn't been tackled yet. #1 has been fixed by latest commit, #2 is still at large. Anyone else can confirm this diagnosis? It's definitely better with 3.10.2. I'm using stable kernel from official repo. With 3.9.9 after suspend cpu was mostly overheating. For now I'm working without any problem. Don't know if it's fixed, but it's still better. Yes, it seems to be ok with 3.10.2. Are you two referring only to the suspend regression or also to the general higher power consumption after boot? I was referring to the suspend regression. But it just happened again with 3.10.2. I guess the patch is not included. I have also noticed some image degradation after resume with 3.10.2. No, the patch wasn't present. Just embedded it. Compiling now. With the patch applied to 3.10.2 everything is ok for me. @firewalker: So there is no graphics corruption and no further problems either? How is your power consumption now (compared to 3.5.6)? No, no corruption, no overheating after suspend. As far as the new power scene, Intel PSTATE. It is better when in powersave mode than the old powersave (acpi). The overall impression is that Intel PSTATE regulates power consumption in a better way. Thanks. Are you using laptop-mode-tools or similar? Could you also post some exemplary numbers when idling with no foreground or background programms running, with brightness set to lowest, enabled WLAN, disabled BT, disabled Ethernet, no attached devices (USB, displays etc. ), with a charged battery? After boot and after resuming from suspend? Why don't you just test it yourself? Nothing anybody posts here can guarantee it will perform the same way for you in any case. If it doesn't pan out, downgrade back to your working kernel. What would this information usefully tell you in any case? My laptop, for example, is essentially unusable with brightness at the lowest setting - might as well save the power and put it to sleep since you can't read anything anyway. I certainly wouldn't be able to get numbers off the thing in that state. This just looks like you are trying to get other people to do your testing for you. If you want to know, test it. Just like if you want to know which DE or WM you should use, install some and decide which you like. Sorry, I didn't mean to appear lazy, it's just that I don't have access to my X220 currently. Also, I wanted to specify the most important parameters in some way so that we can compare the results amongst each other. Disabling most of the things and turning down the brightness has the advantage of making small differences between wattages relatively larger. 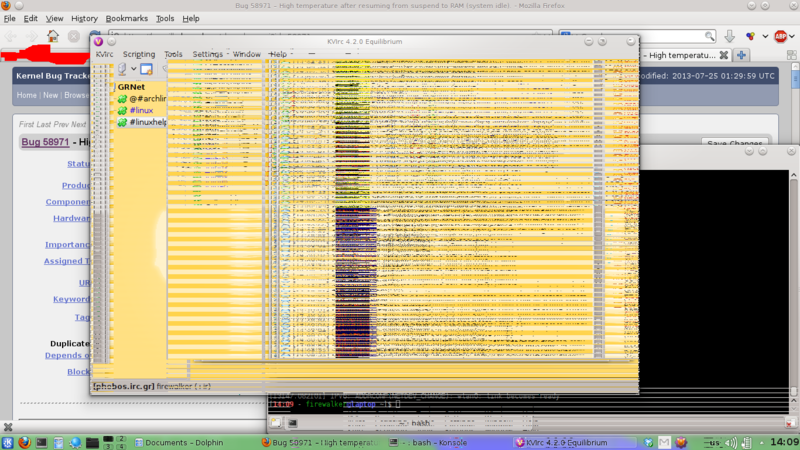 Running 3.11-rc2, and still getting hit by this. Have not tried the patch yet, but I still haven't been able to reliably reproduce yet, so I don't know if I can ever say if it's working. The patch is now in kernel 3.11-rc3, but sadly not in 3.10.4. We will have to wait a little longer till it lands in [core]. If I don't see it again for the rest of time I'll be happy. With the patch to the 3.10.2 there is definitely a display degradation. After some mouse movement the display is ok (with minor artifacts that eventualy goes away). [13137.145780] [drm] This can cause pipe underruns and display issues. [13137.145780] [drm] Please upgrade your BIOS to fix this. Alright, I think we should keep this just to the cpu/gpu scaling issue for 3.6-3.1?.x (?). If you've got graphical issues, I'm just going to recommend starting a new thread. There are already threads on the graphical issue (at least two). There are also at least two apparently distinct graphical issues. So it would be best if people posted to those threads rather than contaminating this one or starting new ones, I think.